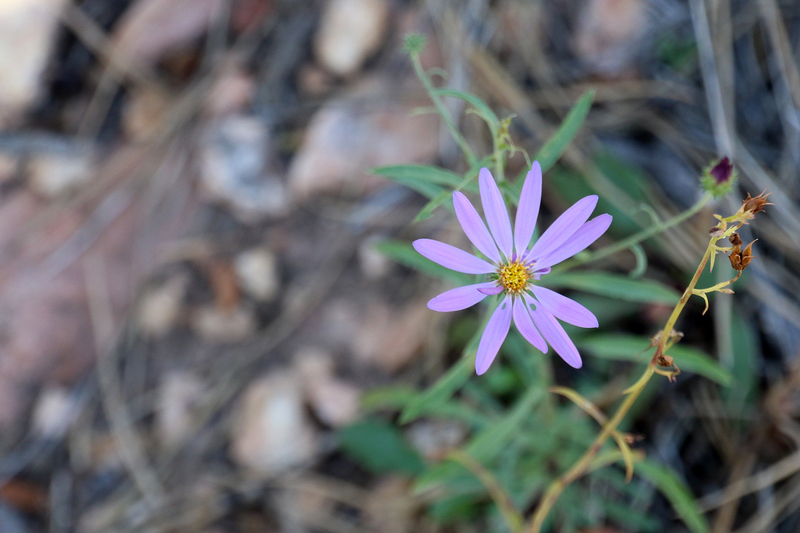 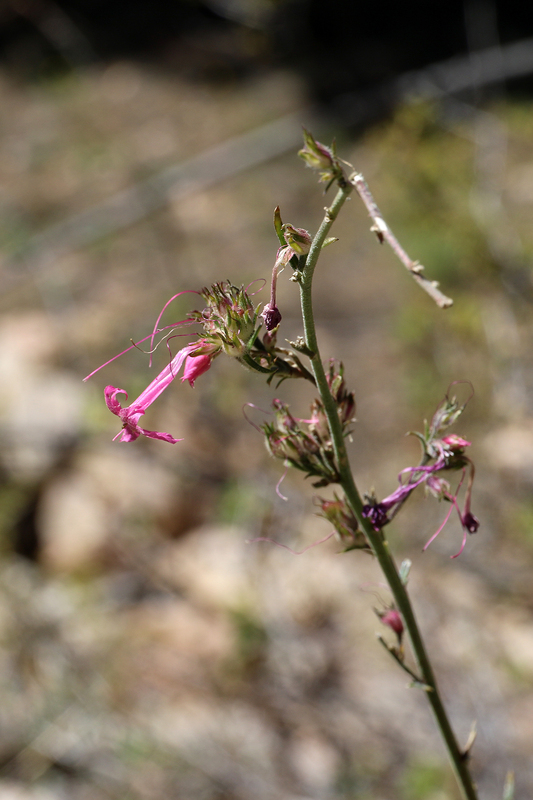 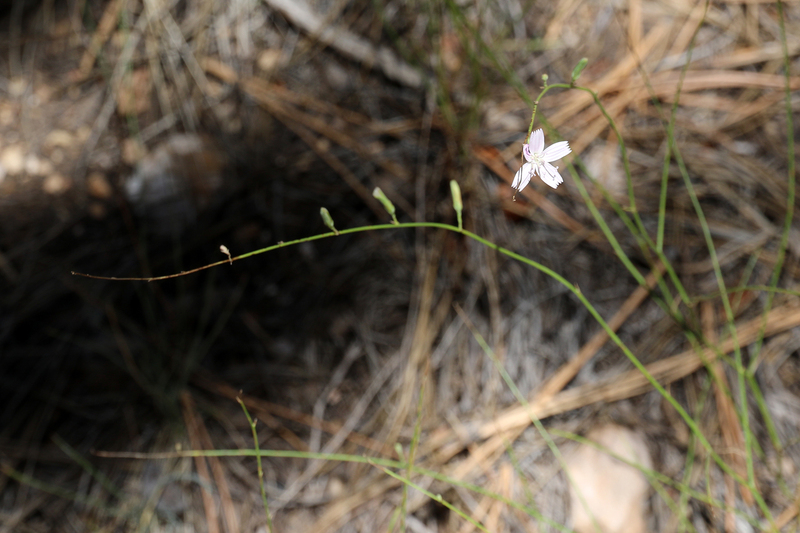 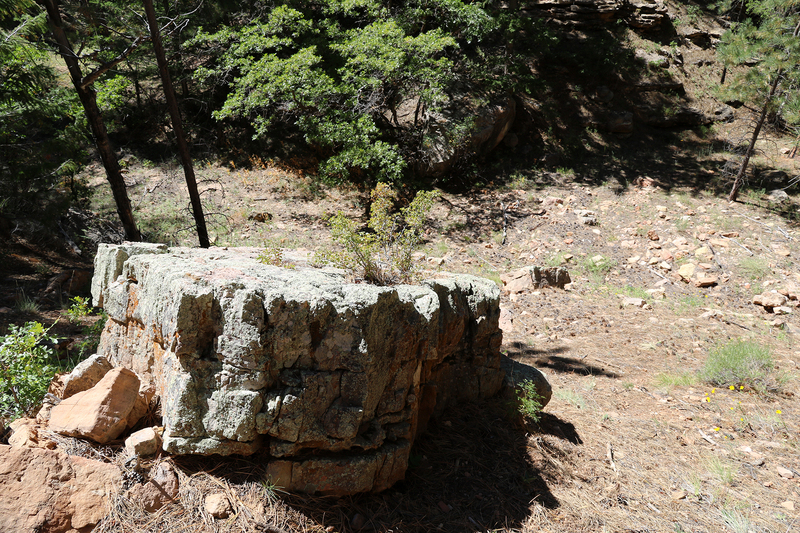 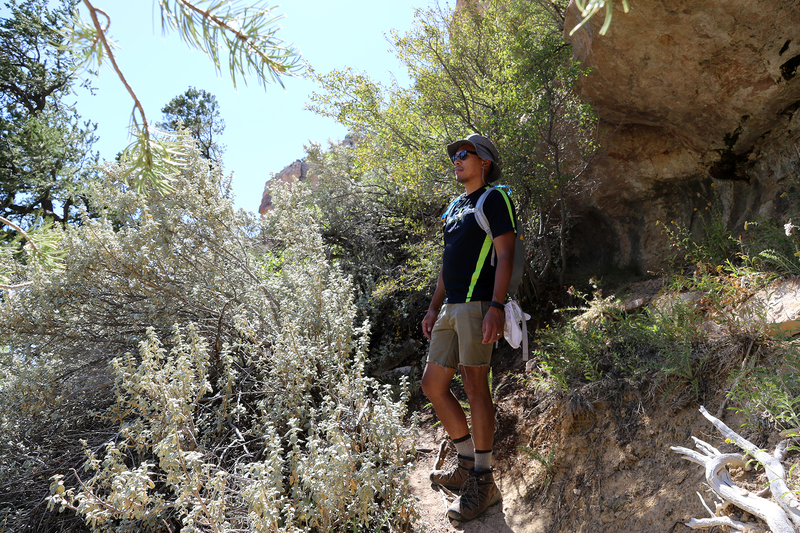 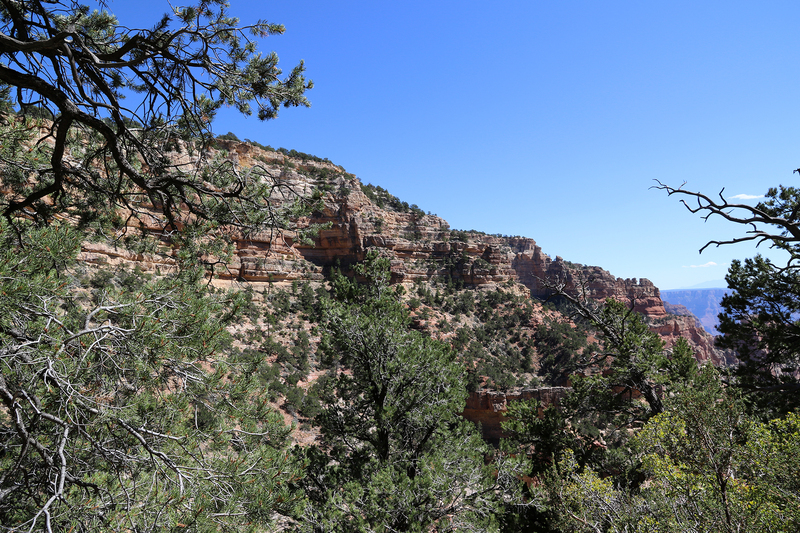 After taking in the views at Cape Royal, we drove a short way north on the Walhalla Plateau to Cliff Spring Trailhead for a hike before lunch on Friday, September 16. 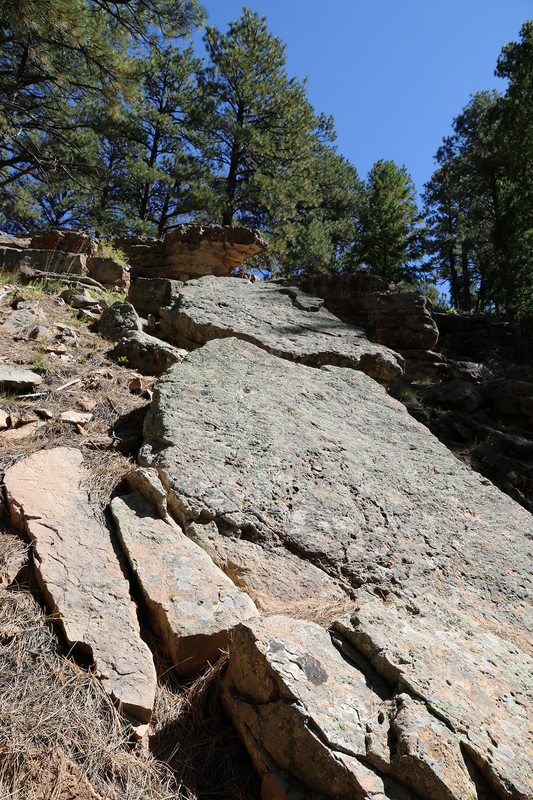 Cliff Spring Trail drops beneath the rim of the Walhalla Plateau into a steep canyon until it reaches a natural spring about half a mile from the trailhead. 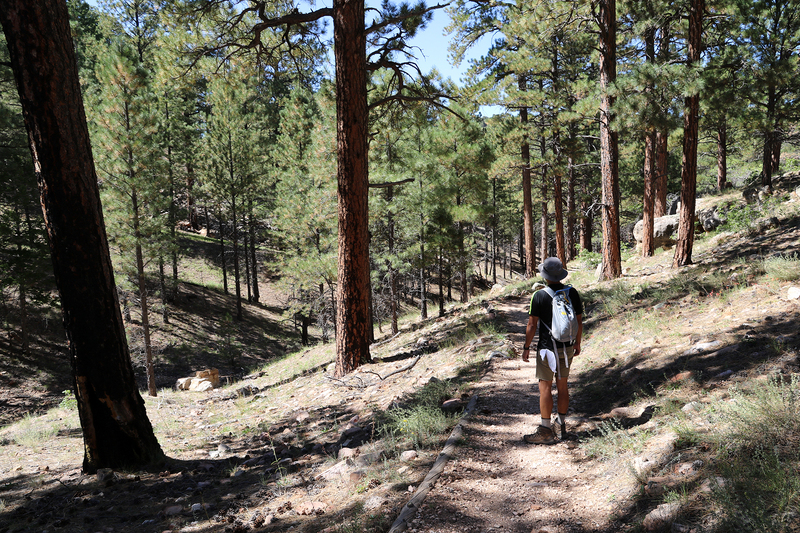 The trail continues for another half mile before it peters out. 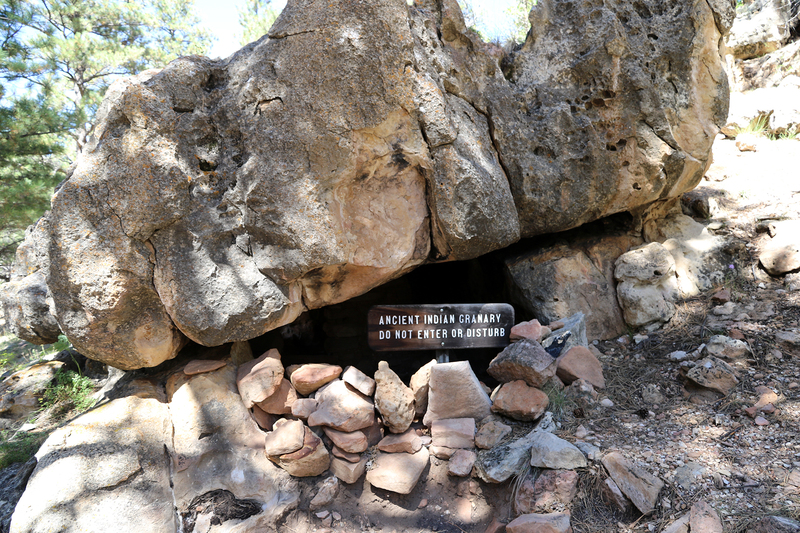 Theodore Roosevelt camped at Cliff Spring during a 1913 hunting trip to the North Rim. 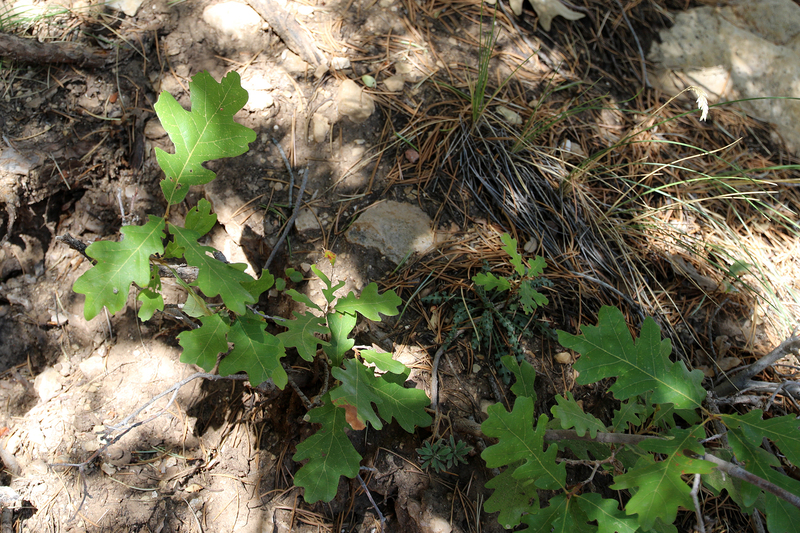 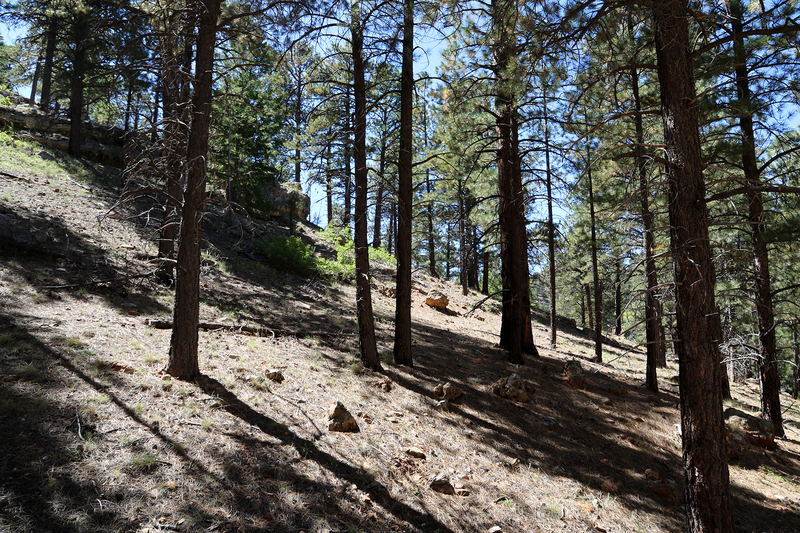 From the trailhead at a pullout at the road, the trail descended to the west through a shallow ravine forested with Ponderosa Pine. 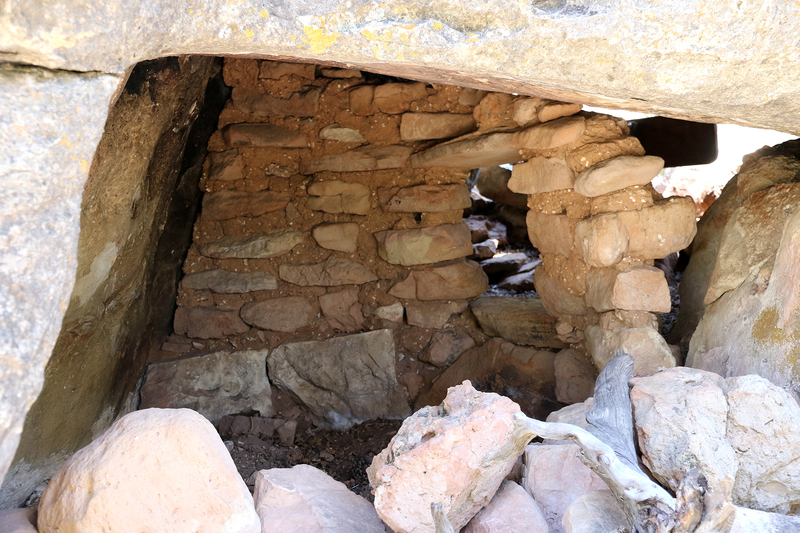 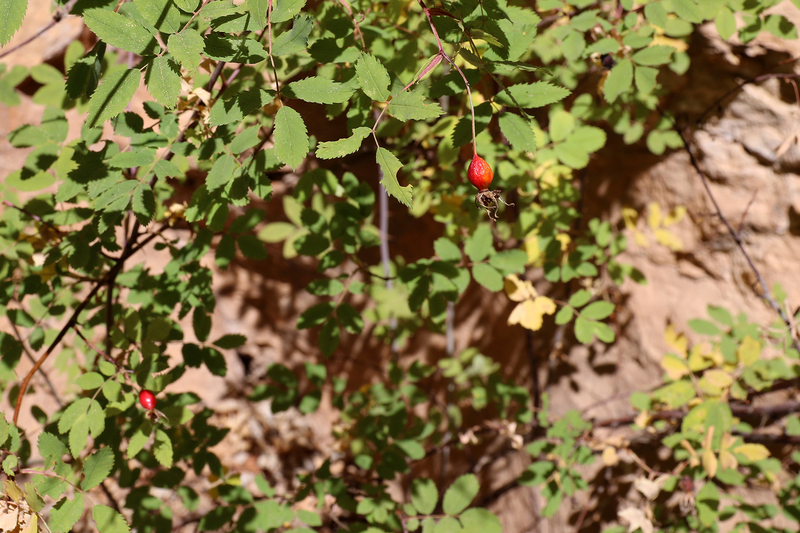 About one hundred yards along the trail we came upon a granary created by the Kayenta Ancestral Puebloans, who lived in the area between 900 and 1150 CE. 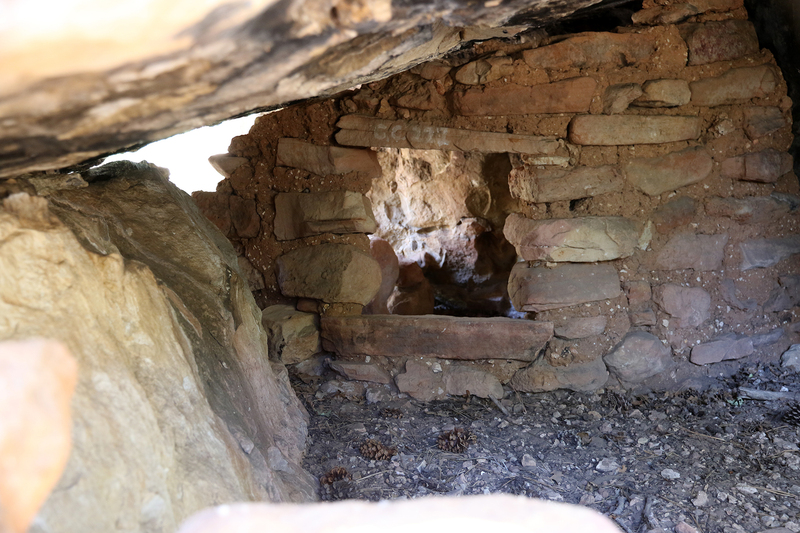 The granary would have been used to store harvests of maize, squash, and beans farmed on the plateaus. 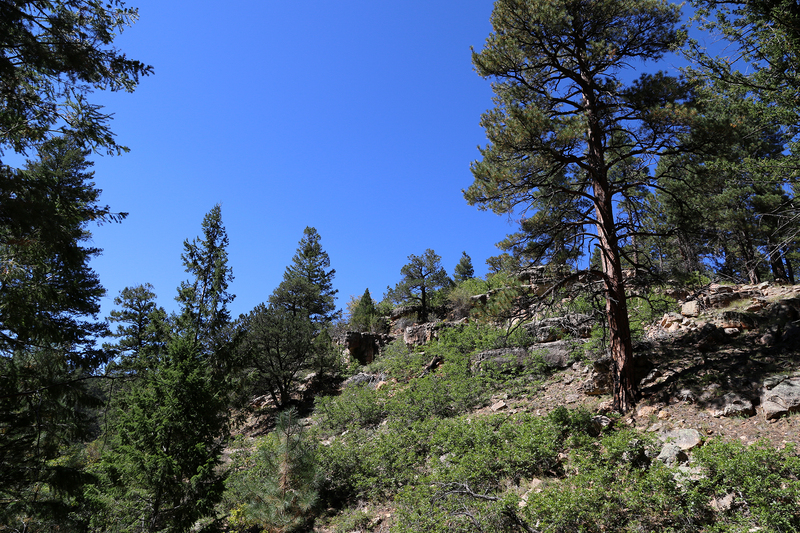 We continued on and passed a party of hikers heading back to the trailhead. 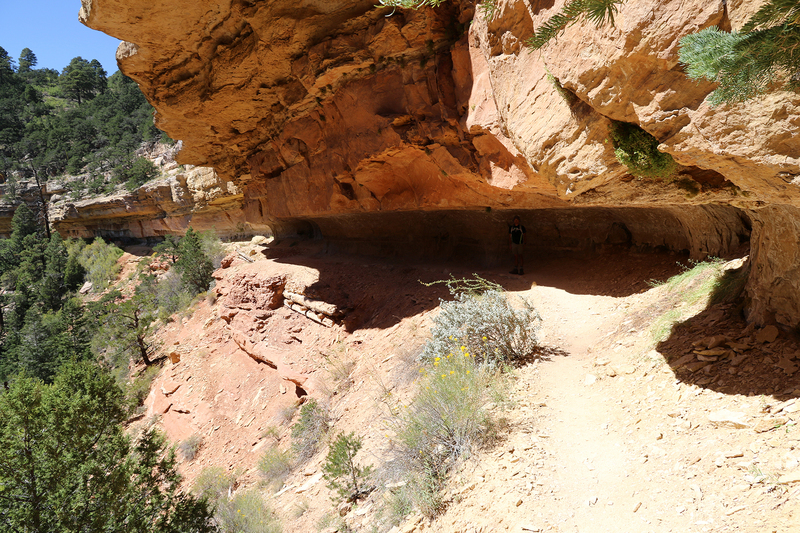 There were only two other vehicles besides ours, so we knew that we’ve have relative solitude on this hike, particularly since one group was already accounted for. 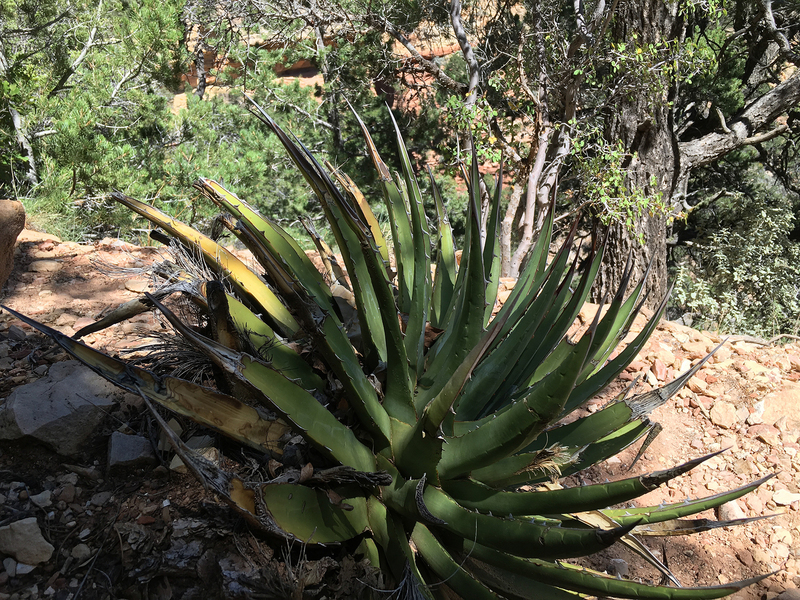 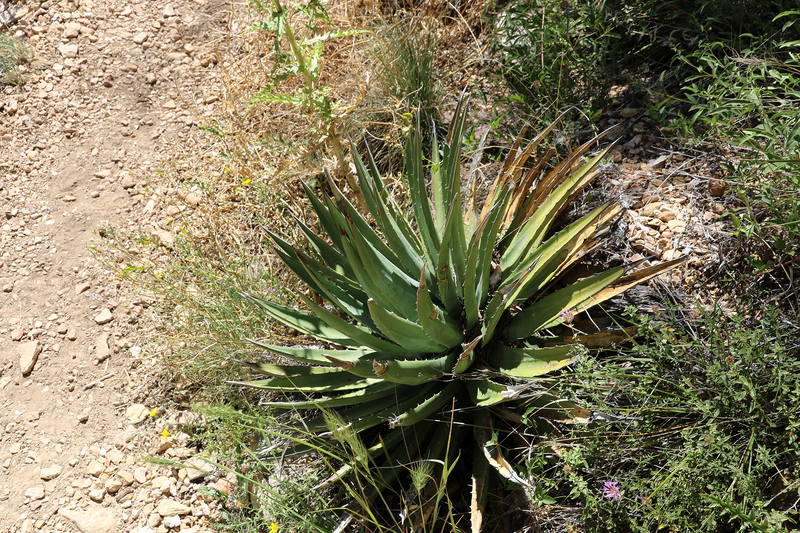 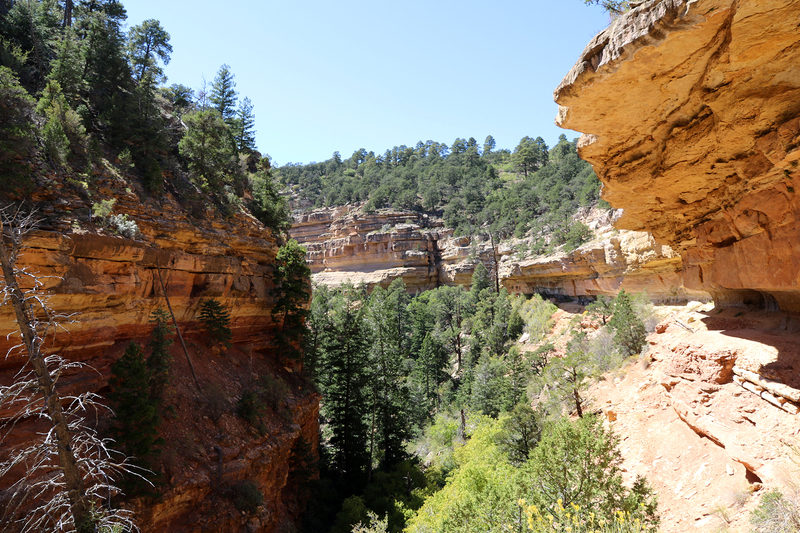 The ravine grew steeper, becoming more earnestly a canyon, and the trail traversed one of the slopes rather than the bottom as it had at first. 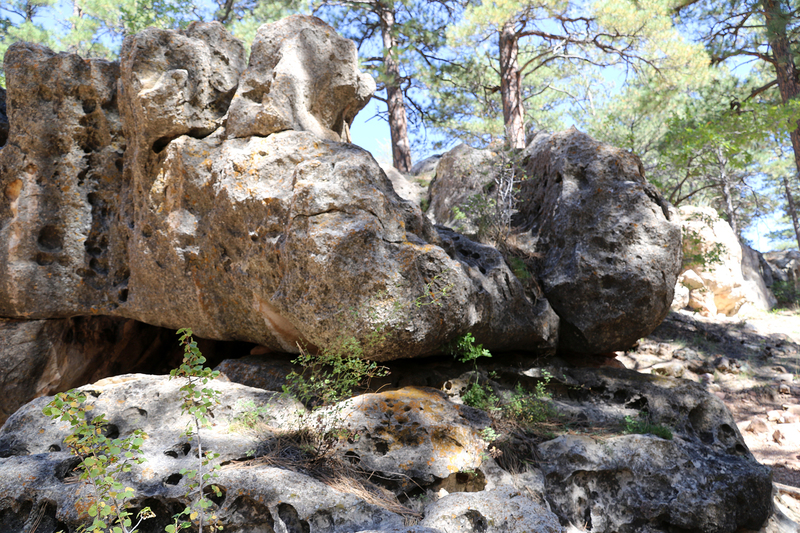 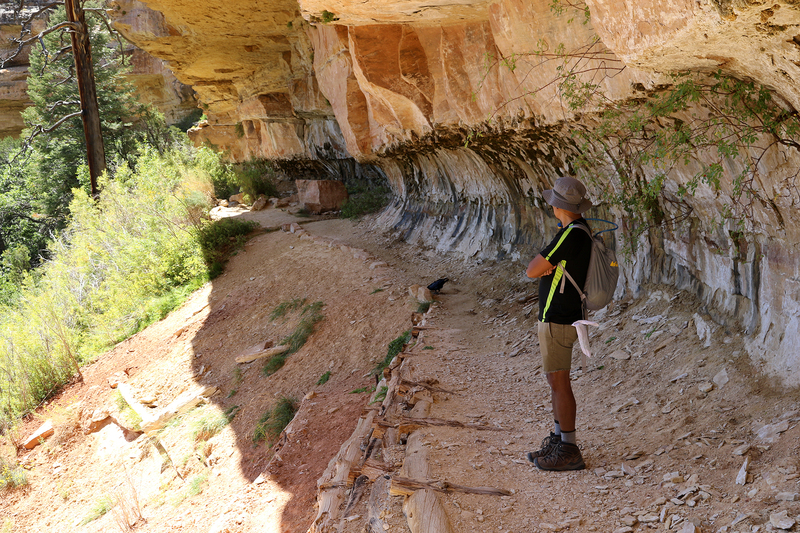 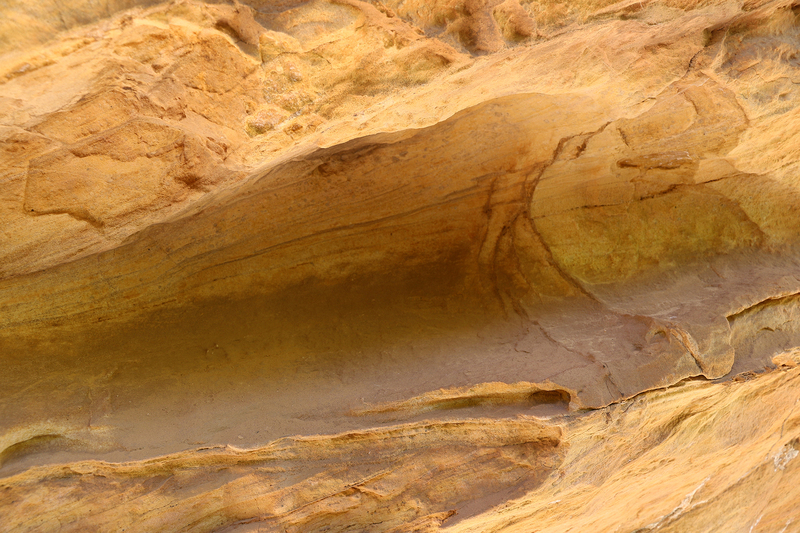 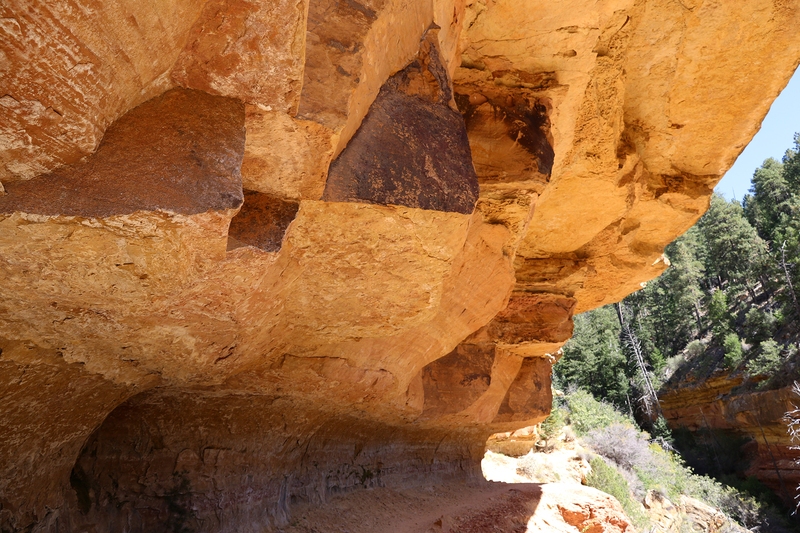 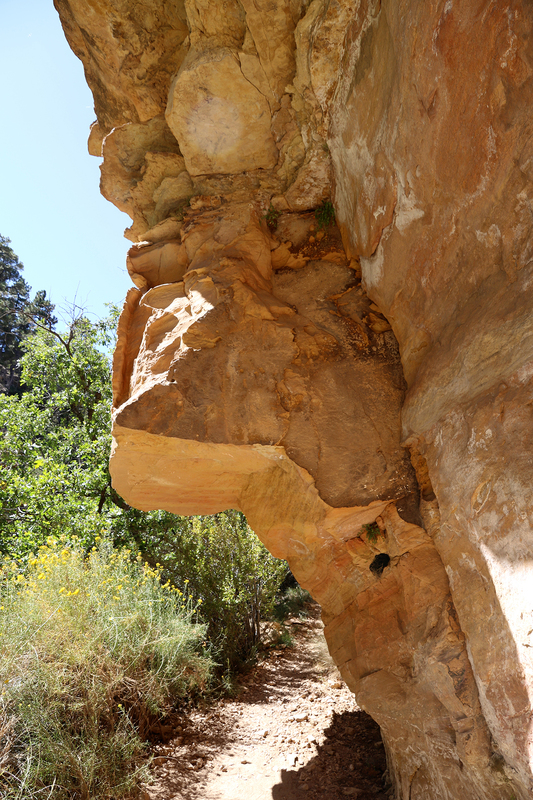 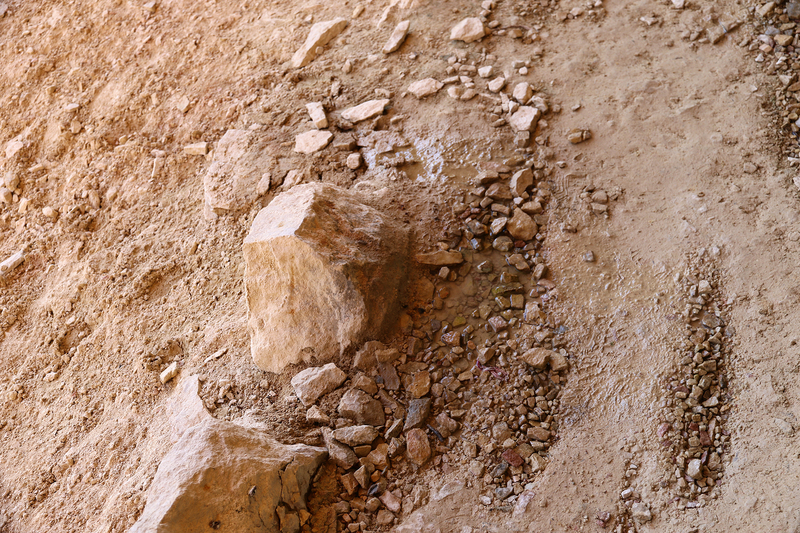 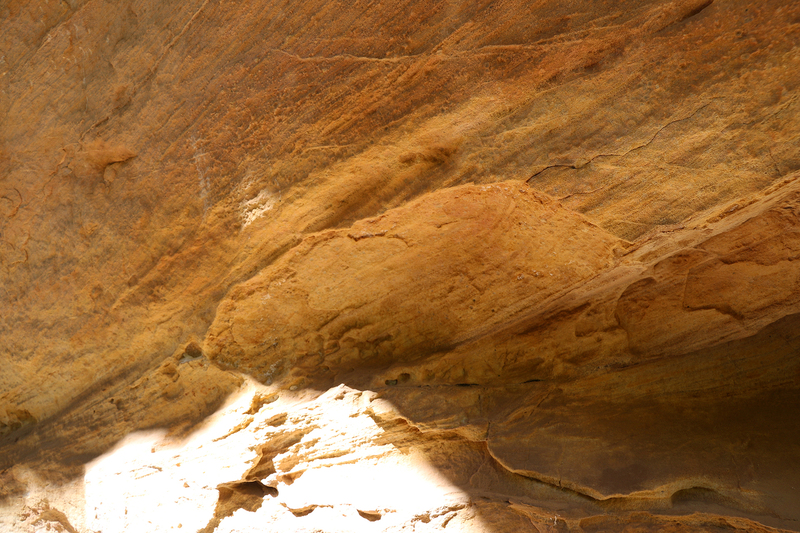 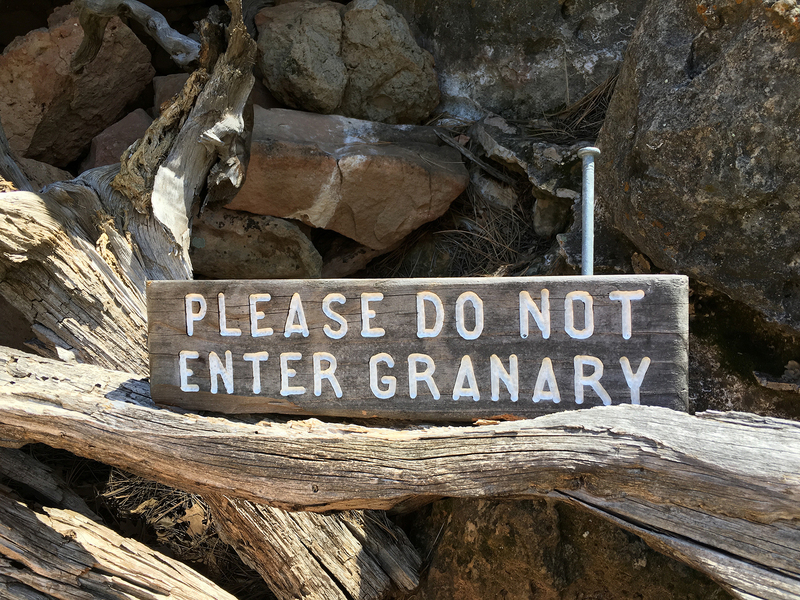 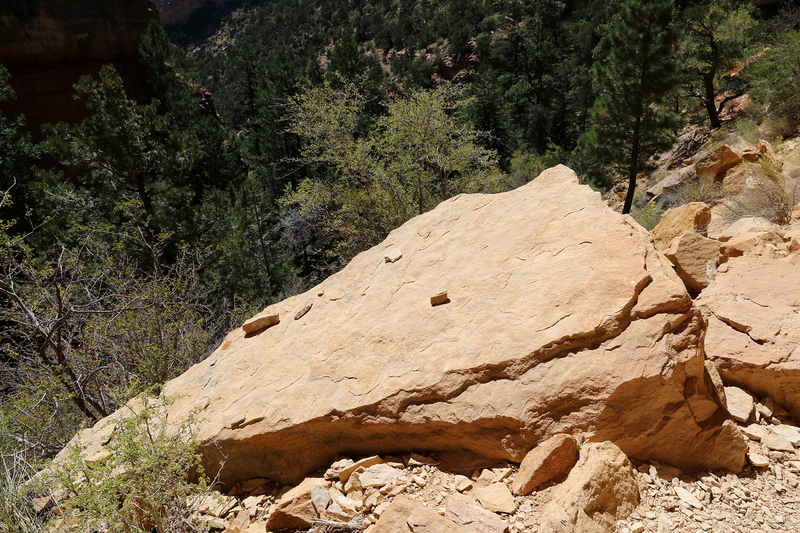 The canyon/ravine was littered with occasional boulders that had fallen from points higher on the slope, attesting to the constant erosion of the Grand Canyon. 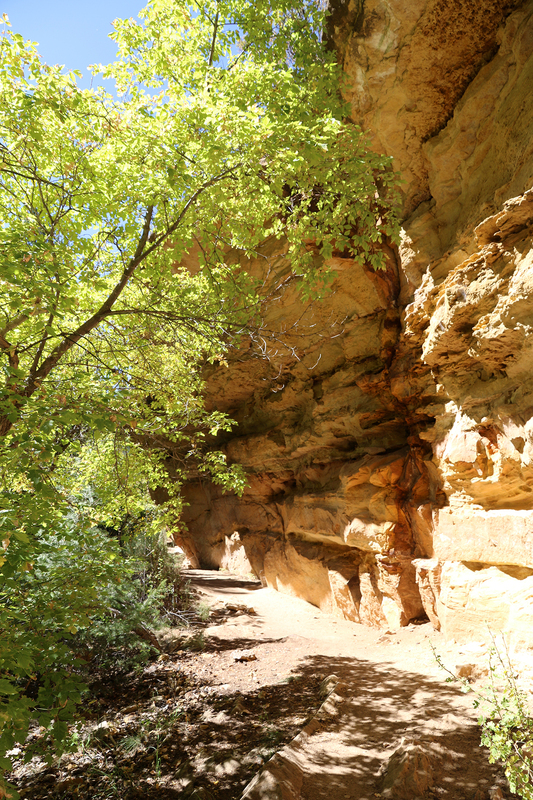 The ravine gave way to a narrow, steep-sided canyon as the path crossed from one side to the other and continued under the cliffs on the north side of the canyon. 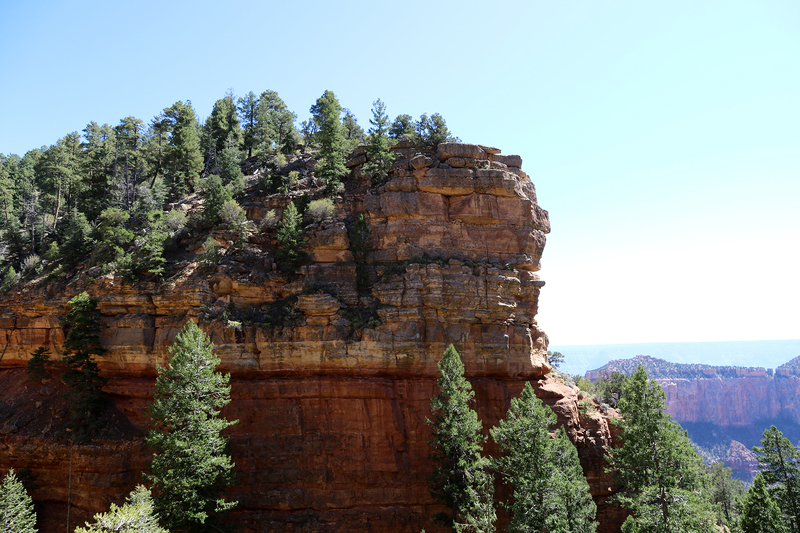 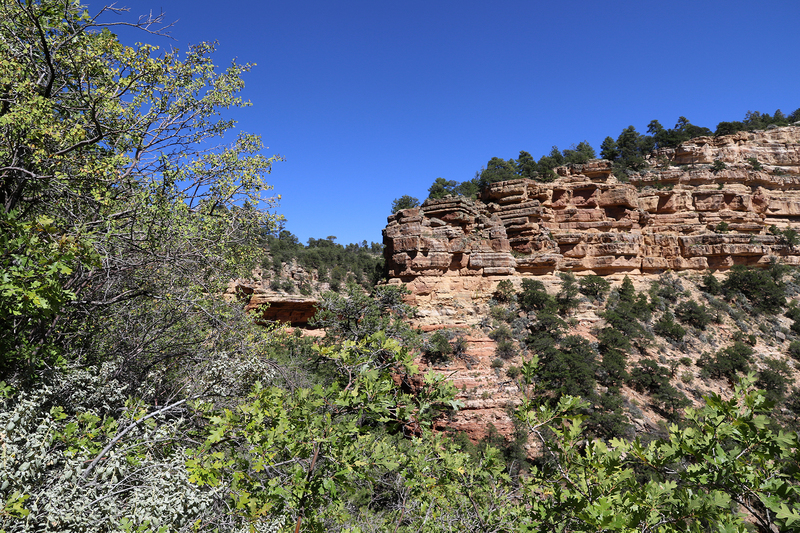 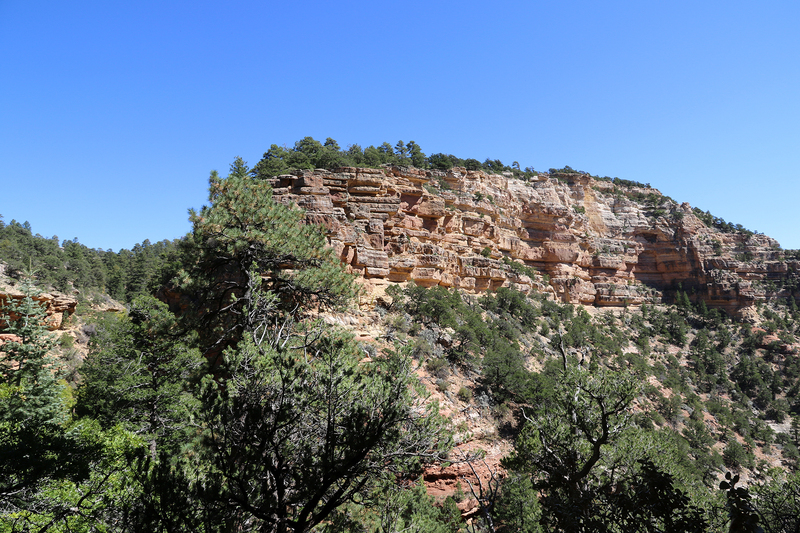 The cliffs were made of Kaibab Limestone (which largely forms the rim of the Grand Canyon). 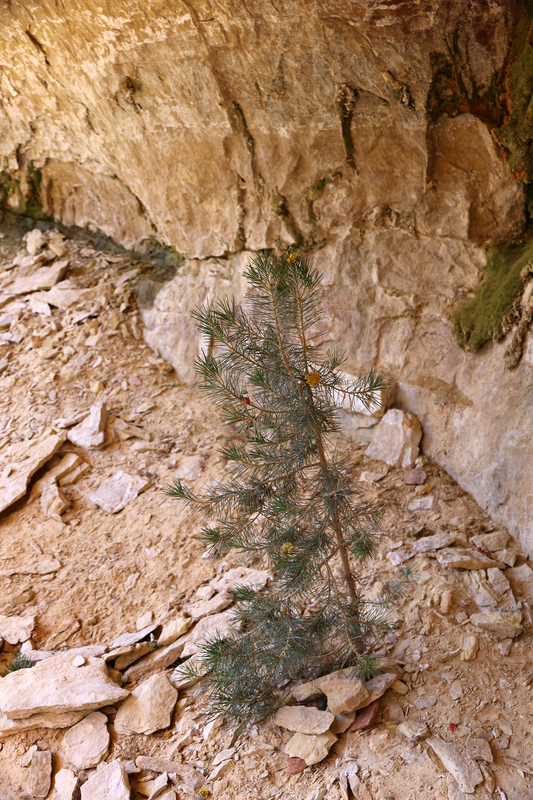 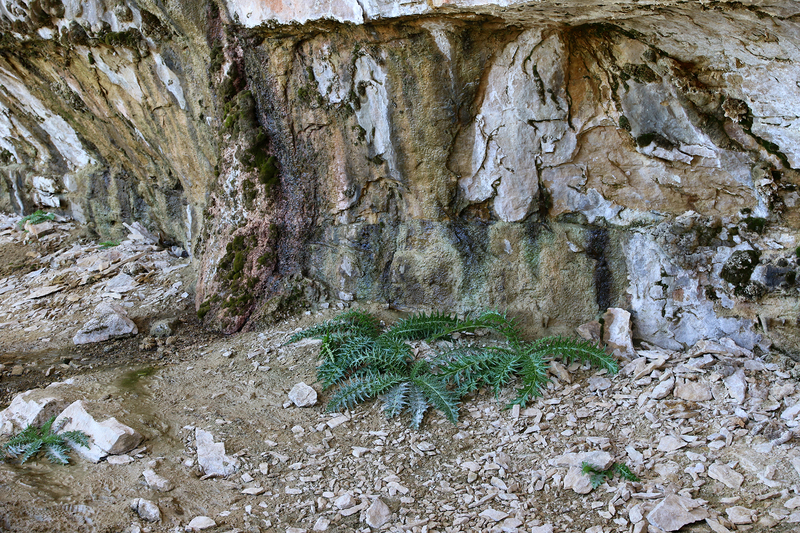 The limestone dates from the early to middle Permian Period, some 290 million years ago. 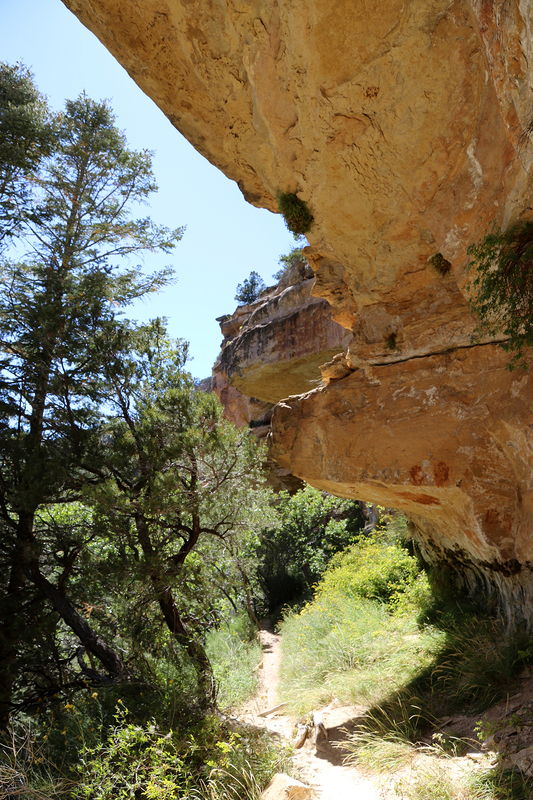 Farther along, the trail became quite dramatic, deeply carved beneath the overhanging cliffs. 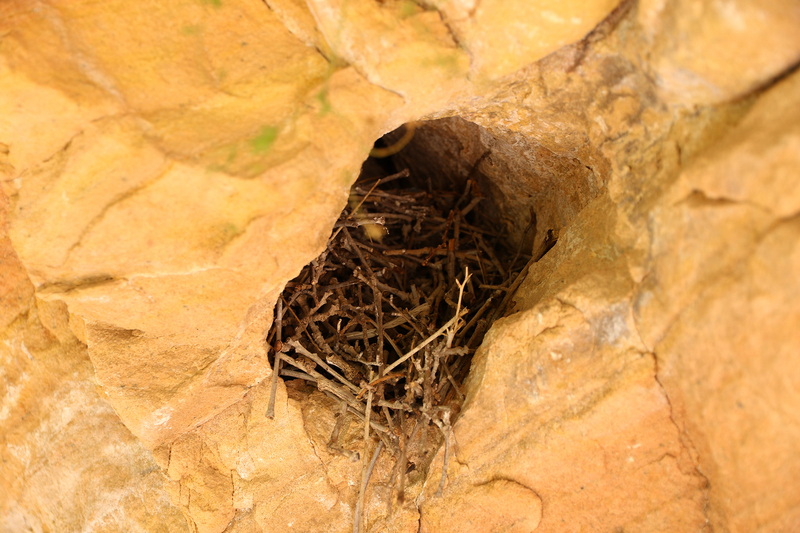 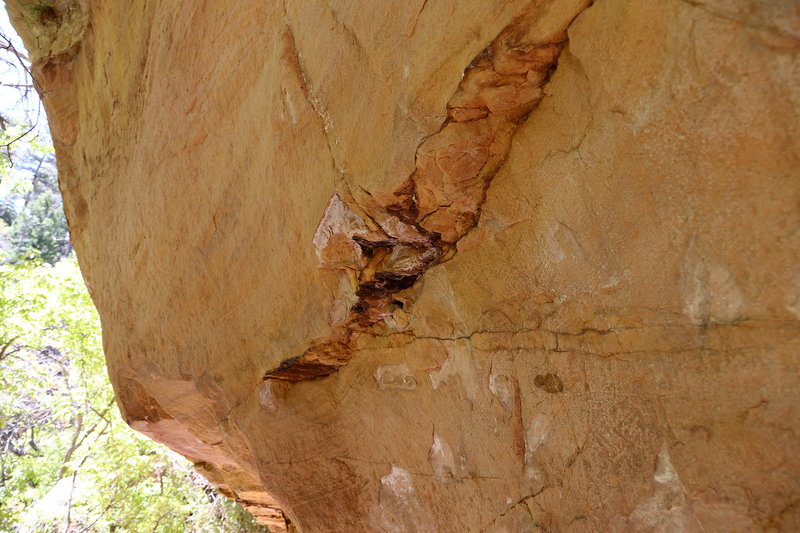 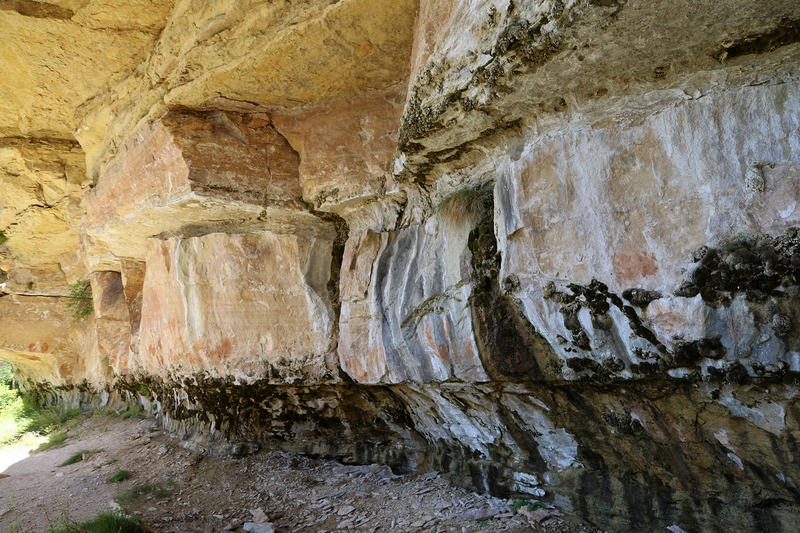 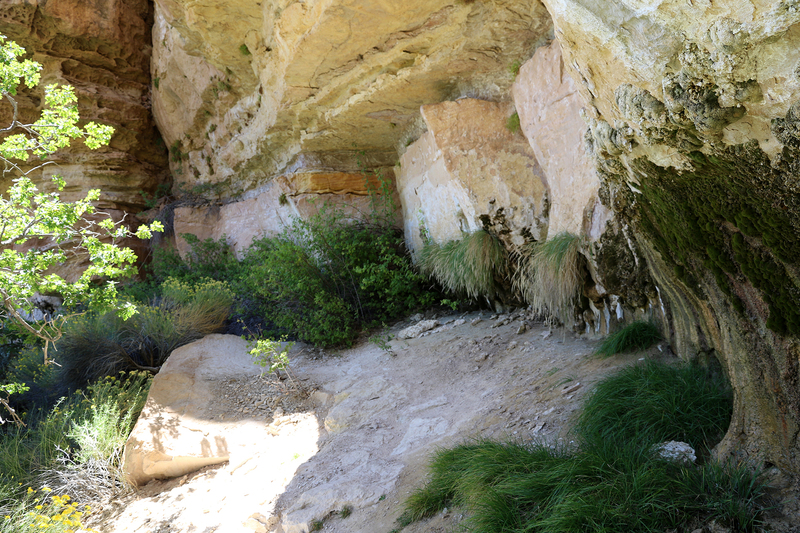 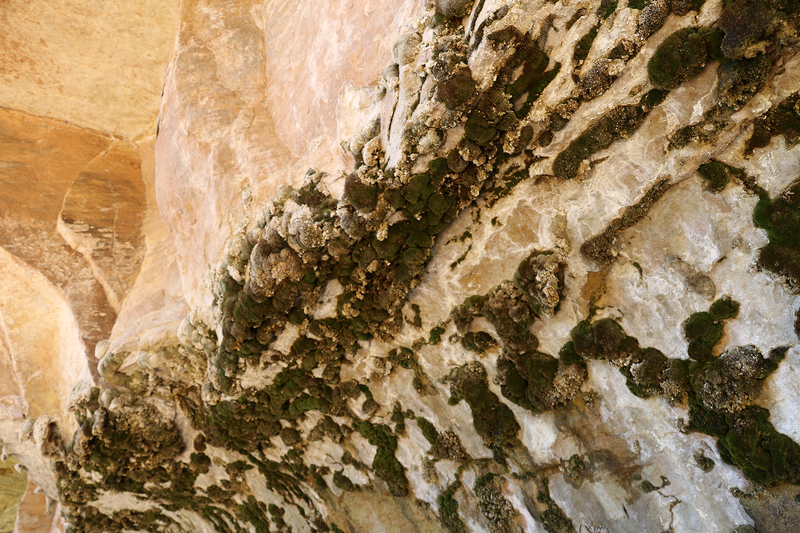 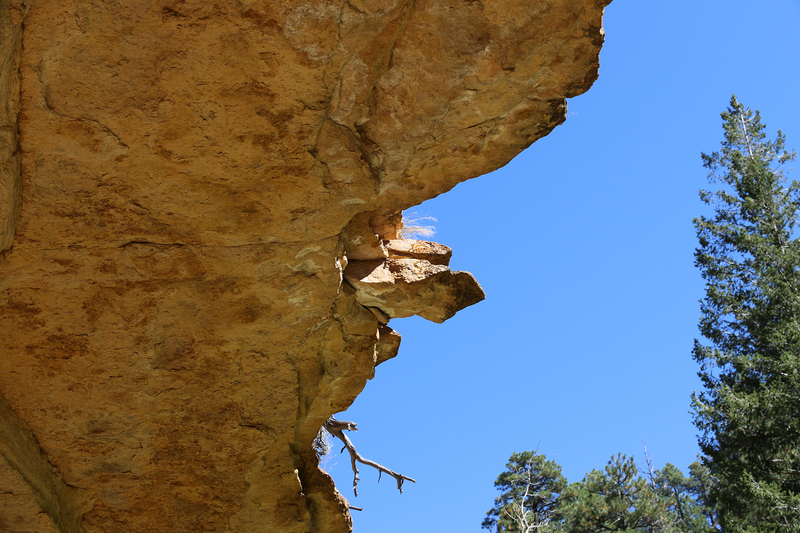 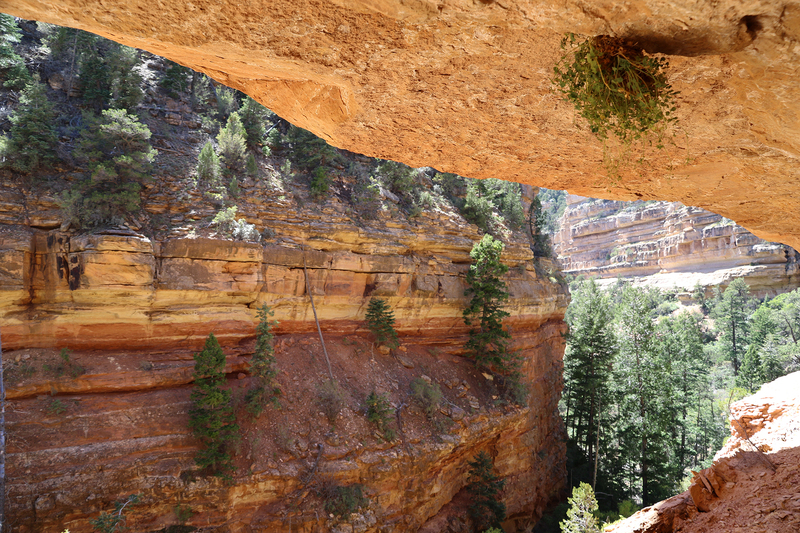 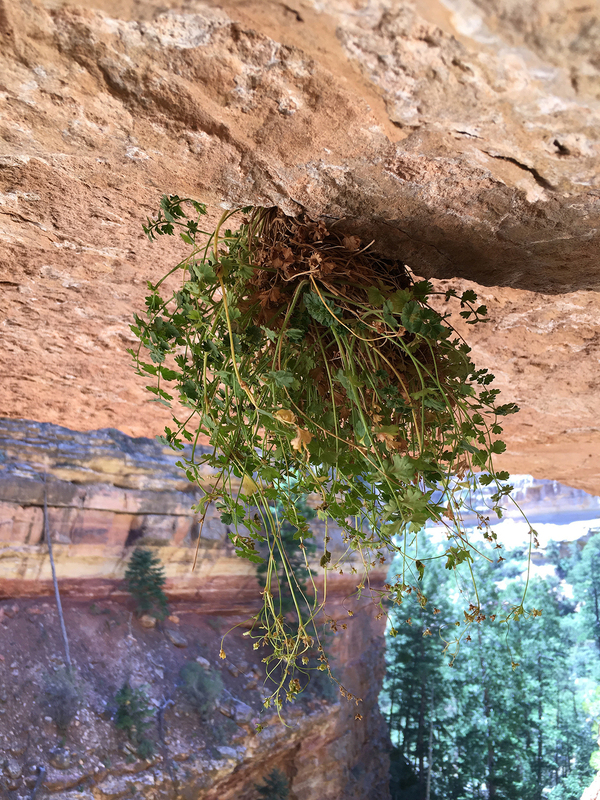 Beneath the overhang, cracks in the limestone channeled moisture to a few hanging gardens. 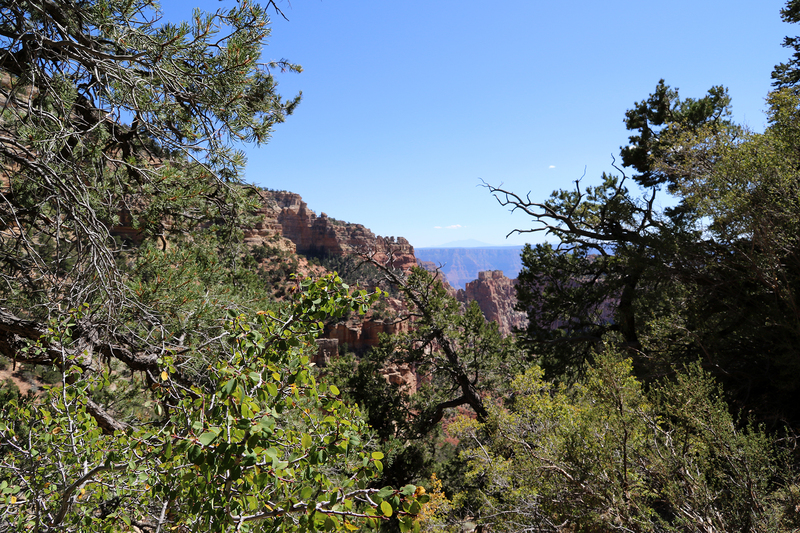 Across the canyon, trees improbably clung to the steep slope. 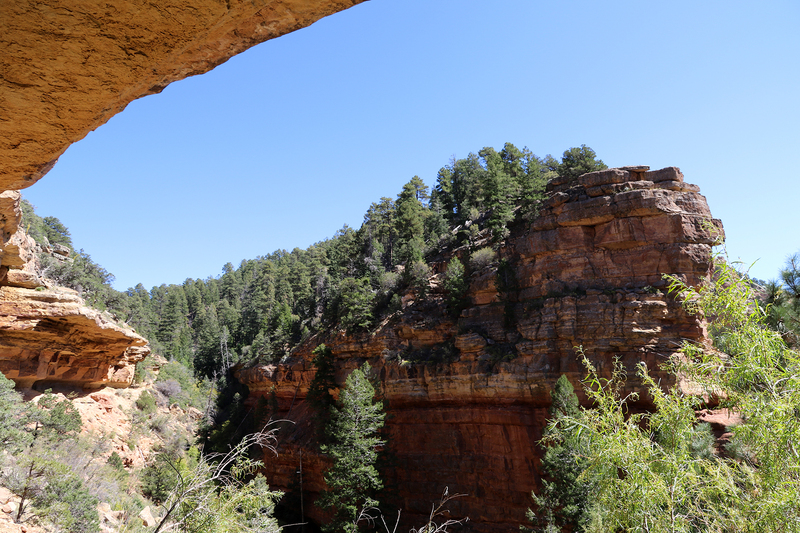 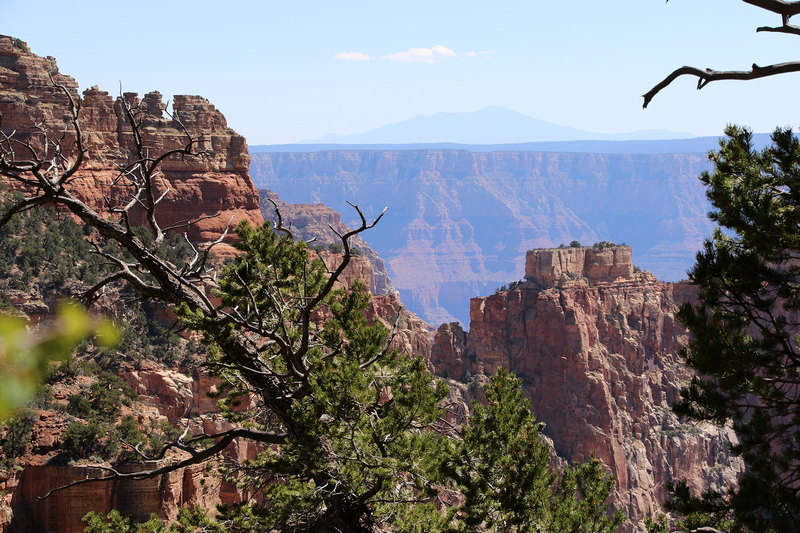 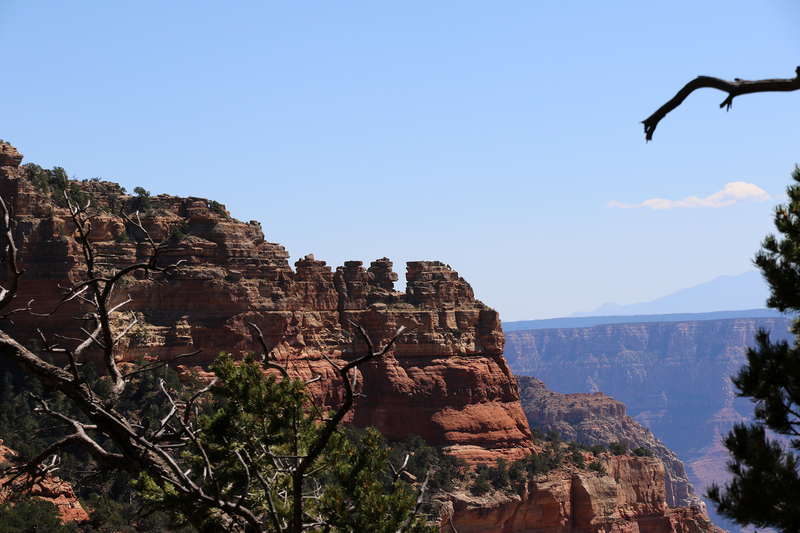 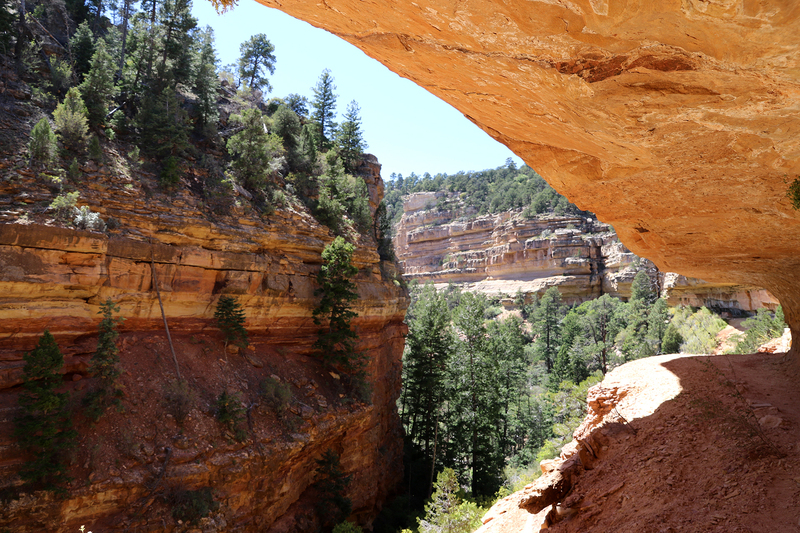 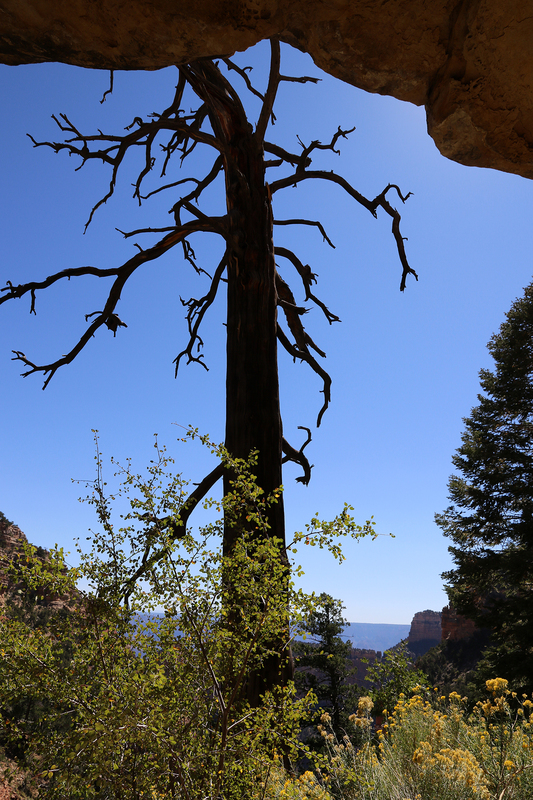 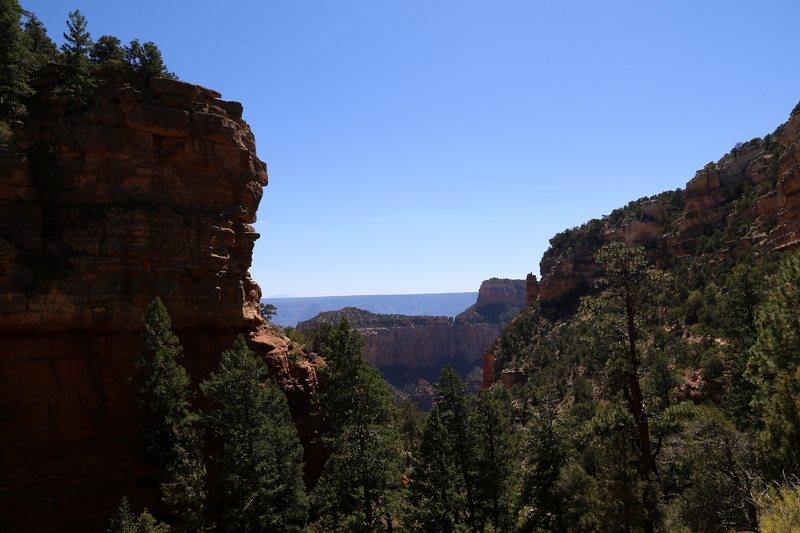 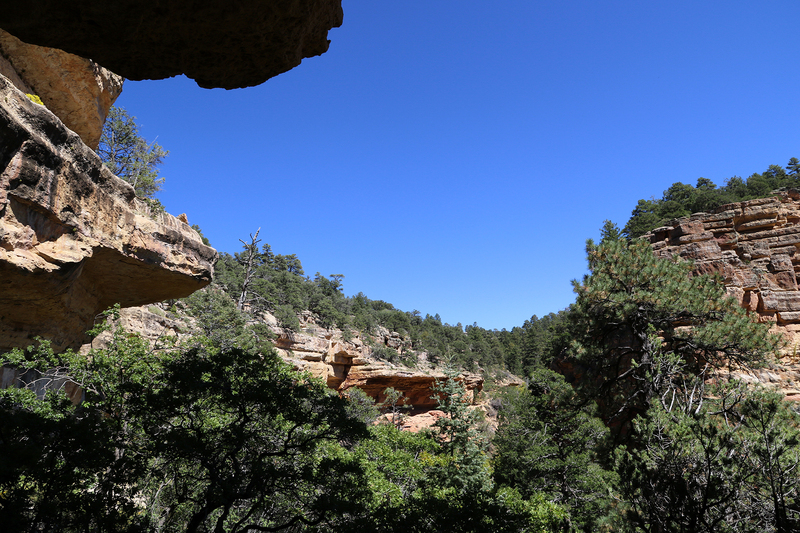 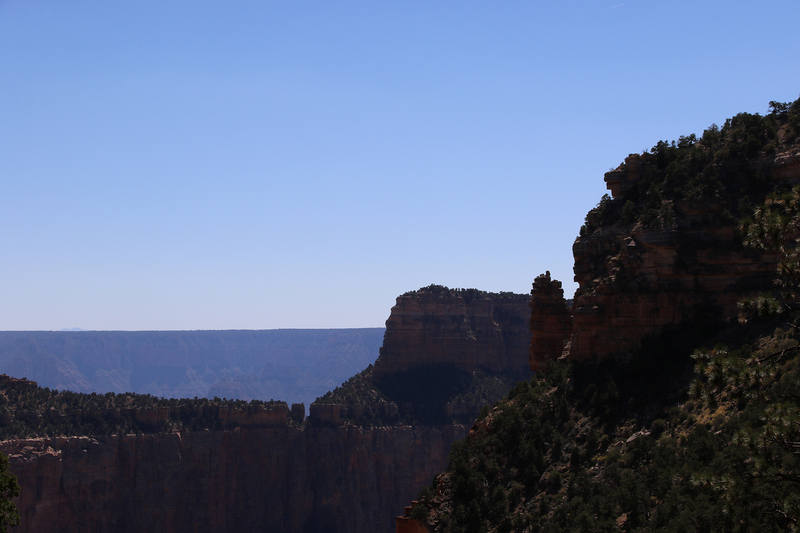 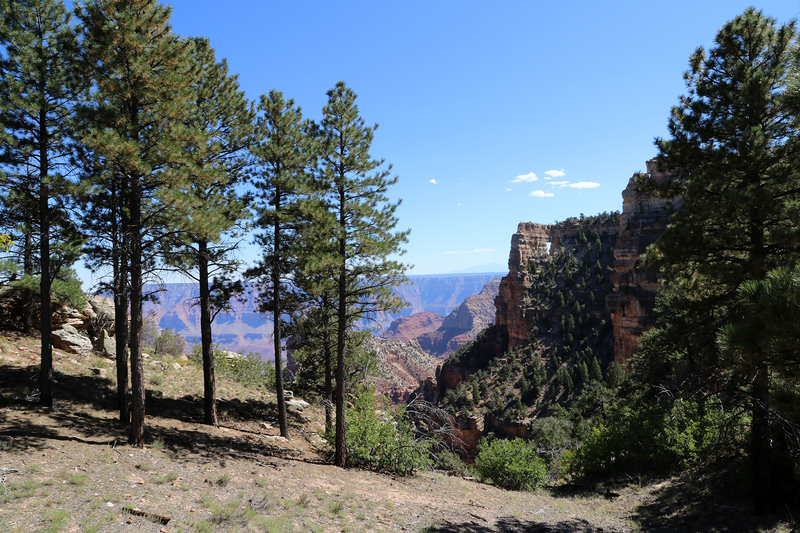 The trail turned south, opening up views from the tip of the Walhalla Plateau into the greater Grand Canyon beyond. 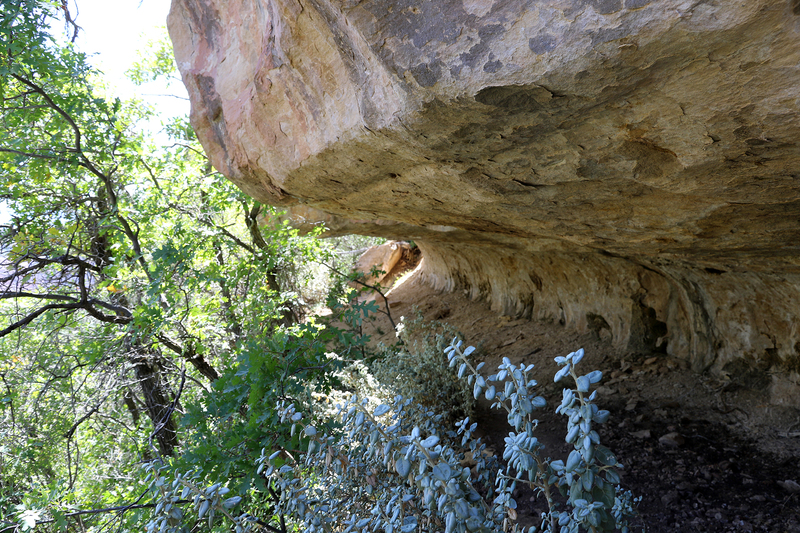 We were beneath the parking area for Cape Royal, which was up on the plateau across from us. 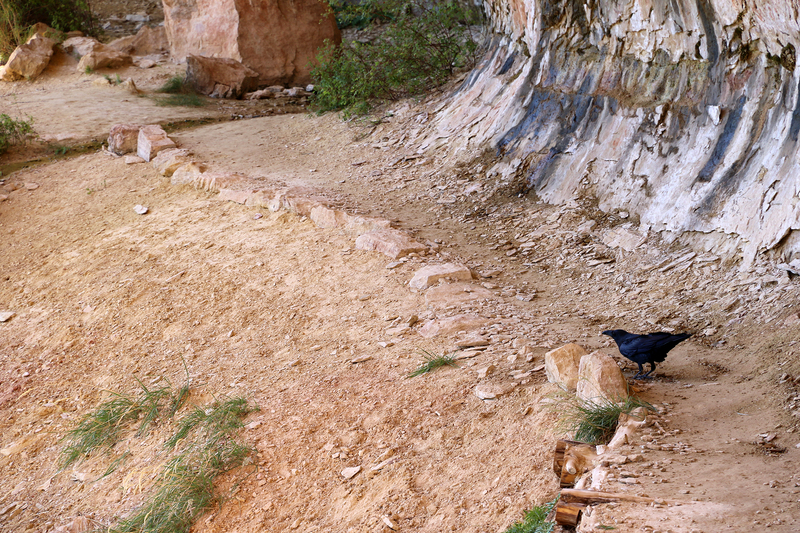 A Murder Raven tried to guard the spring from us before flying off angrily squawking. 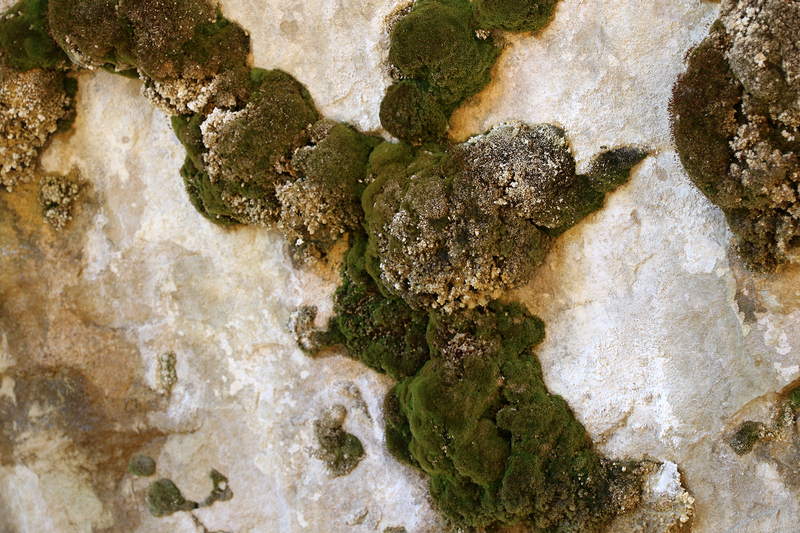 The seeping spring caused mosses and lichens to grow all along the cracks in the limestone. 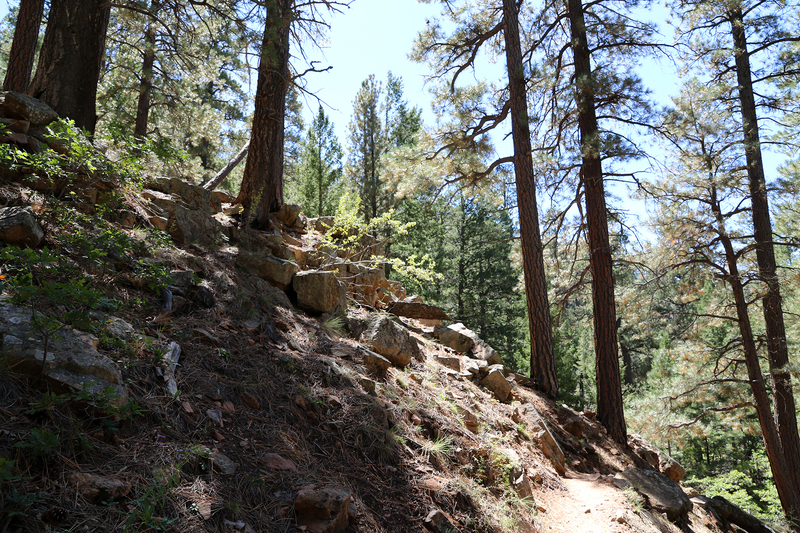 We had by this point passed the second hiking party as they made their way back to the trailhead, so we had the spring to ourselves. 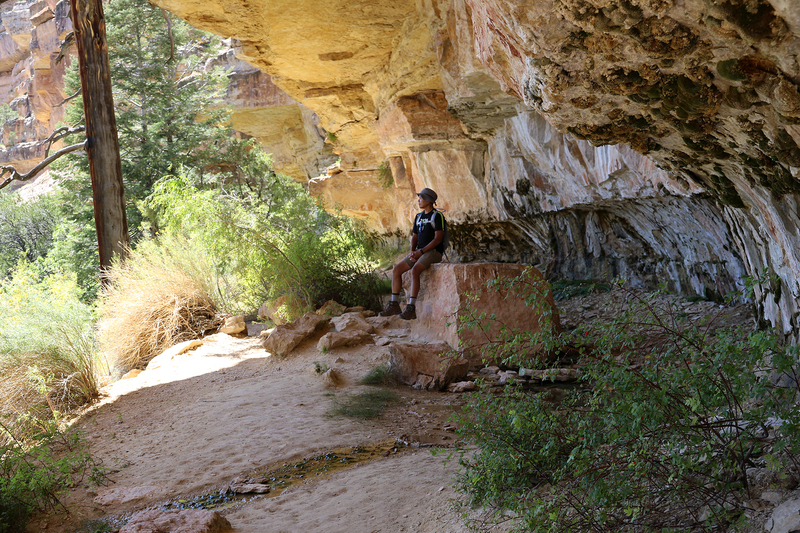 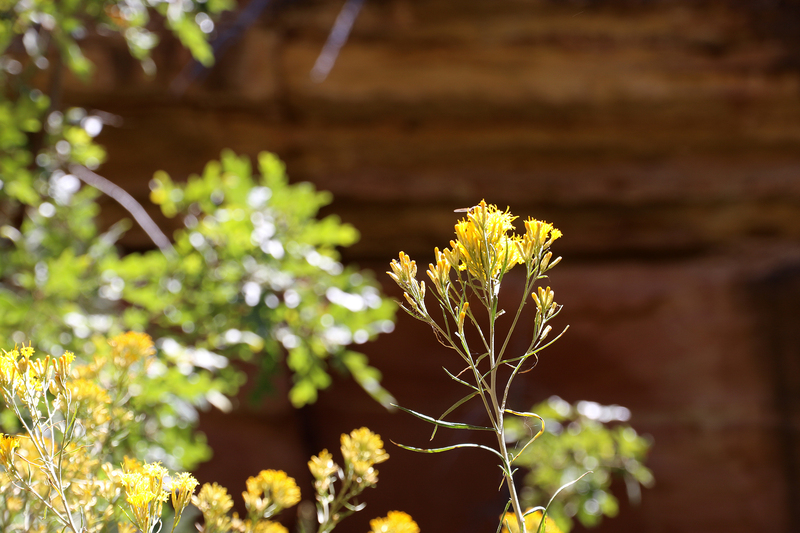 It was a lovely, shady place to sit and gaze out into the canyon. 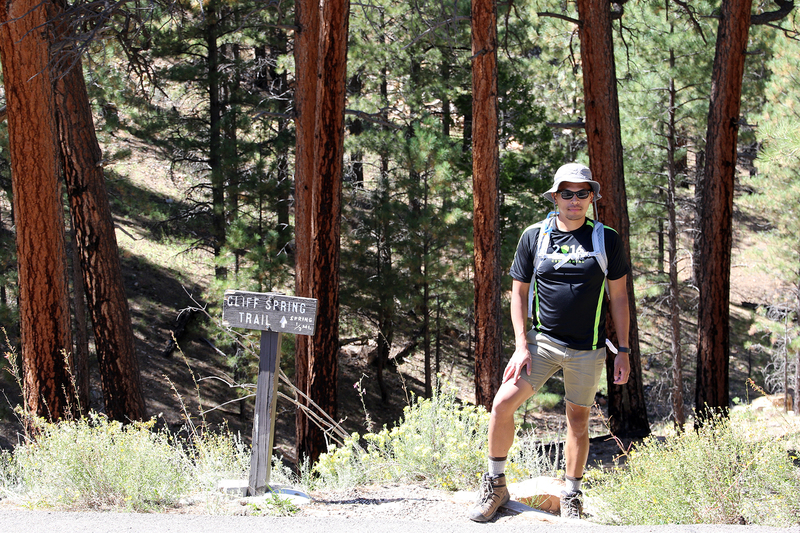 We decided to keep going. 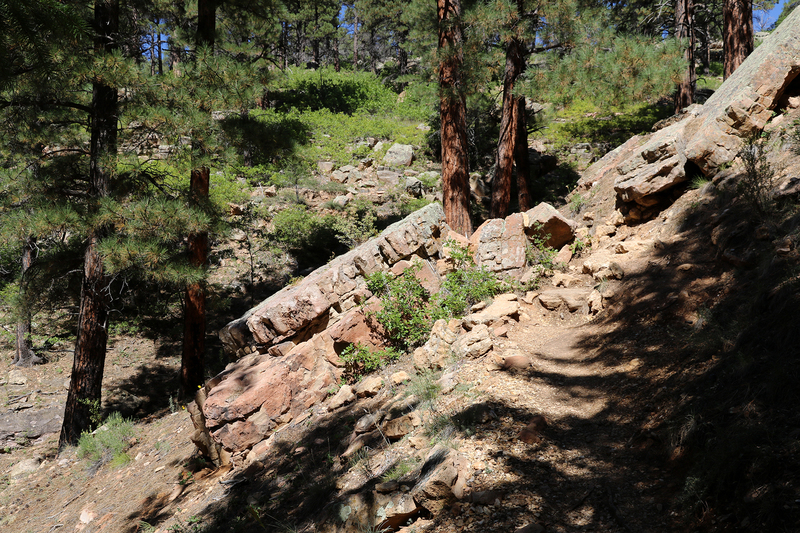 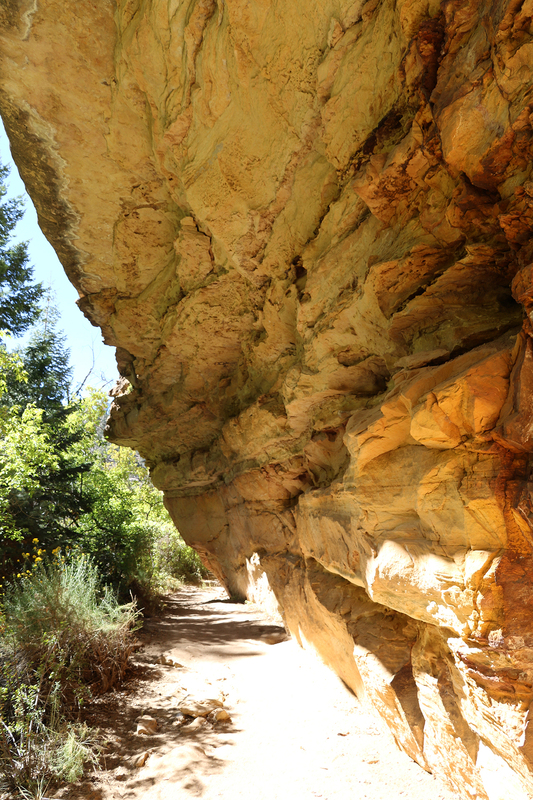 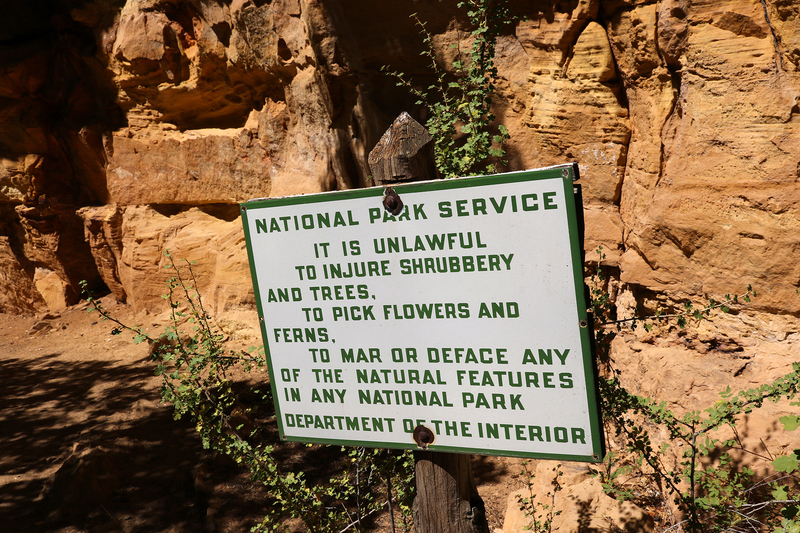 After the spring, the trail is not technically maintained, and it narrows as it leads hikers south along the western face of the cliffs. 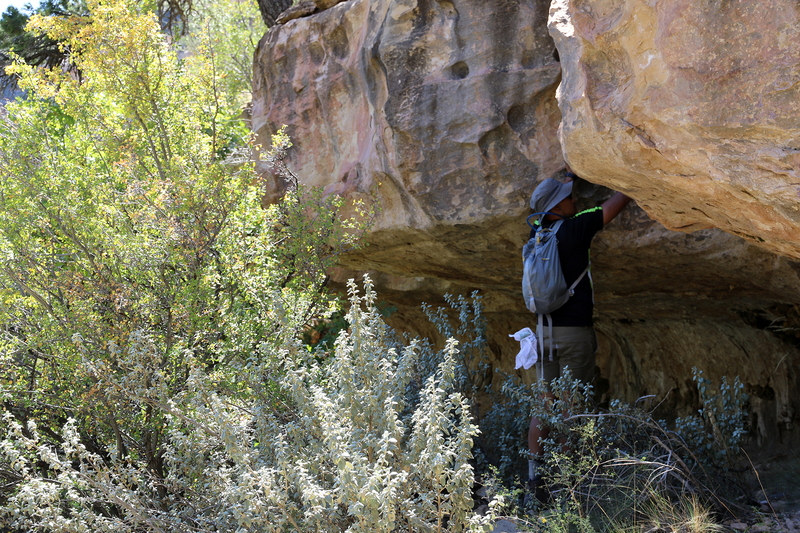 We had to do a little scrambling, and even some very light bushwacking, to get through. 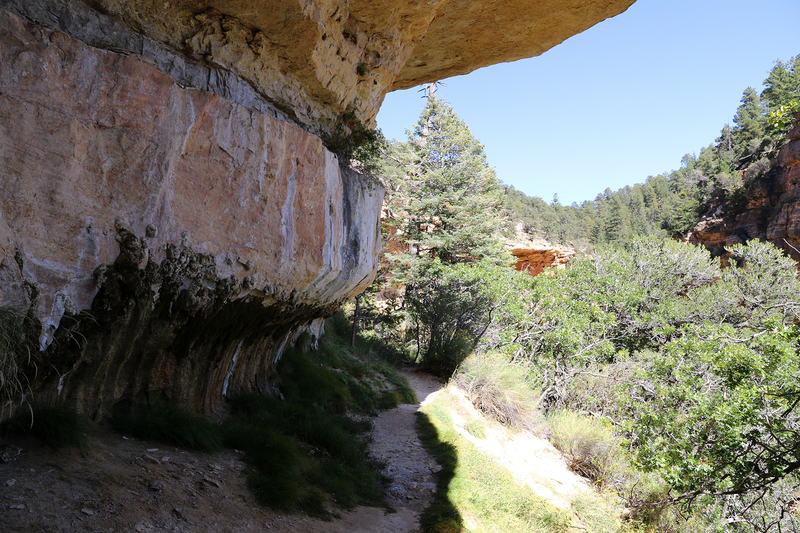 The overhang was much lower here, and we had to crouch to continue on. 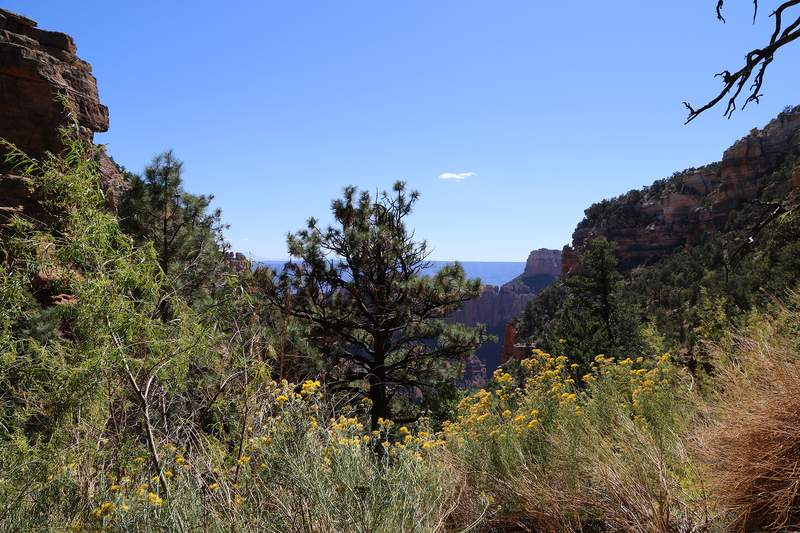 The views out beyond Cape Royal into the Canyon made the effort well worth it. 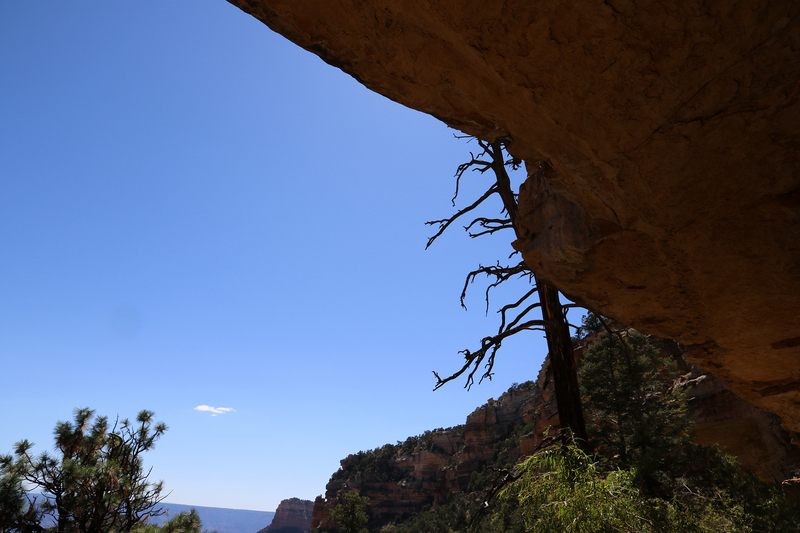 The view and the warmth of the sun and the adventuring together was magical. 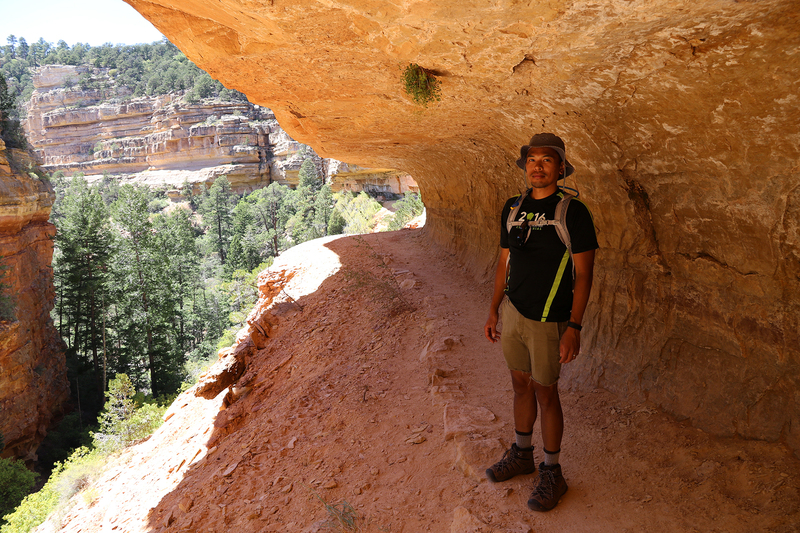 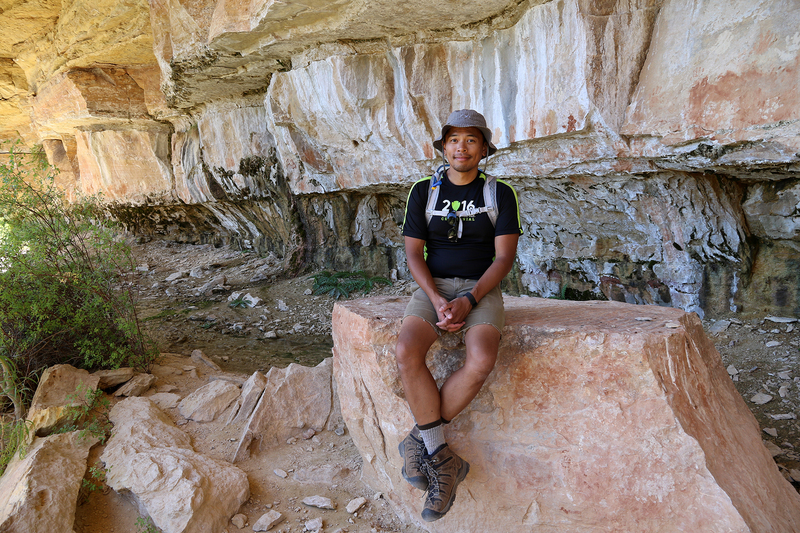 We were both quite moved on this short, but hugely rewarding hike beneath the rim. 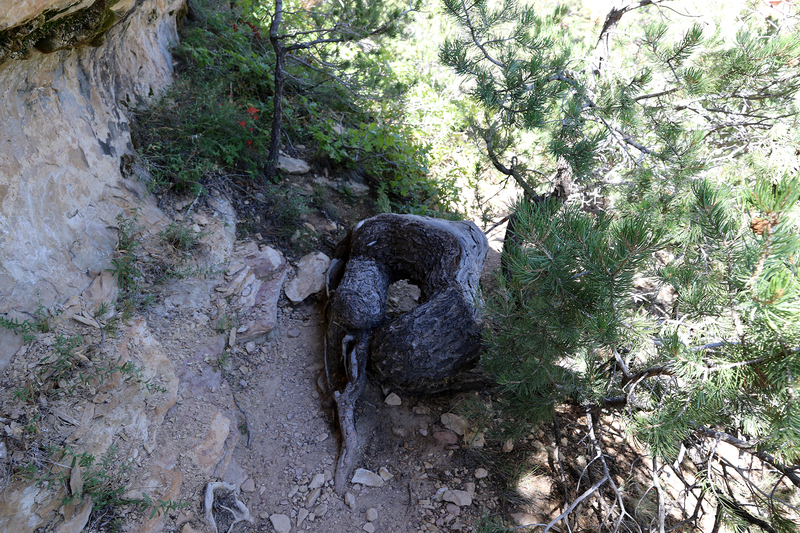 We stood on the trail and made out for a while. 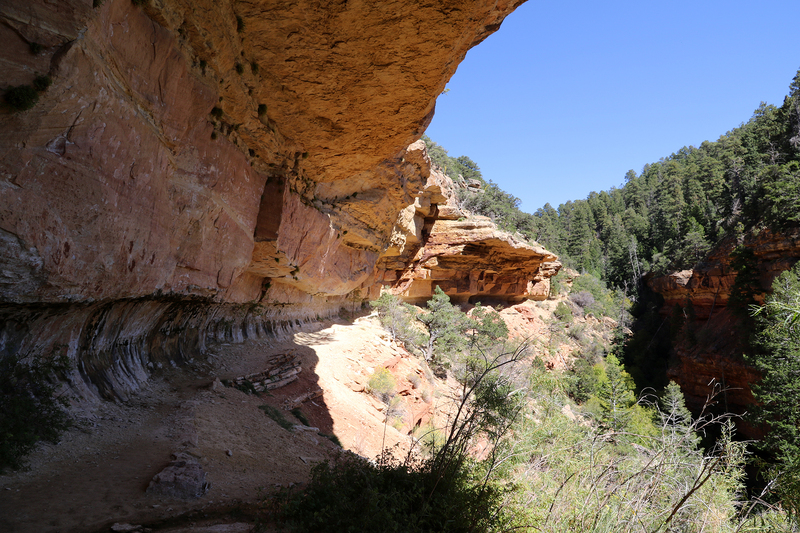 Some semblance of trail continues half a mile beyond the spring before vanishing into the cliff face near the end of the side canyon. 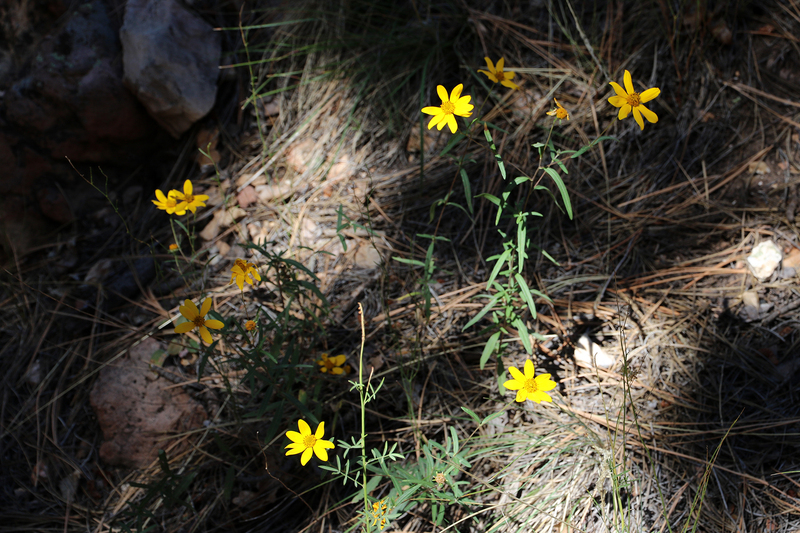 It was so overgrown, however, that we stopped at about a quarter mile and turned back the way we’d come. 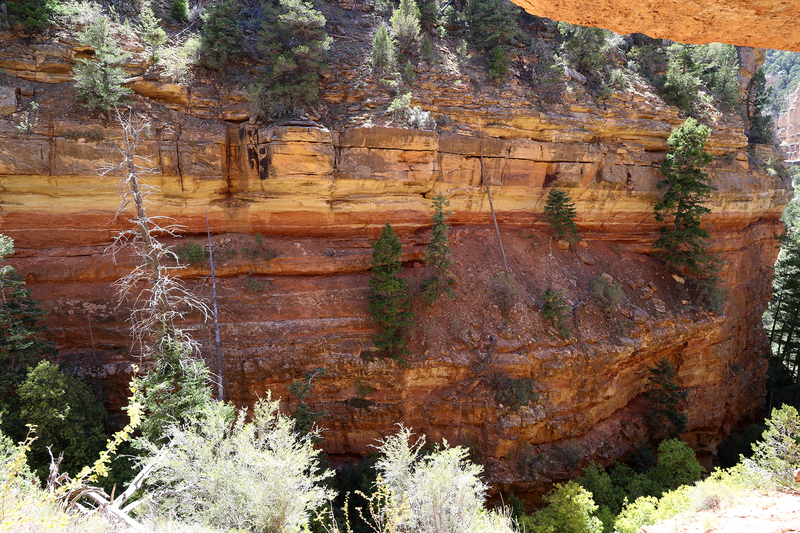 Our Cliff Spring Trail hike took about an hour. 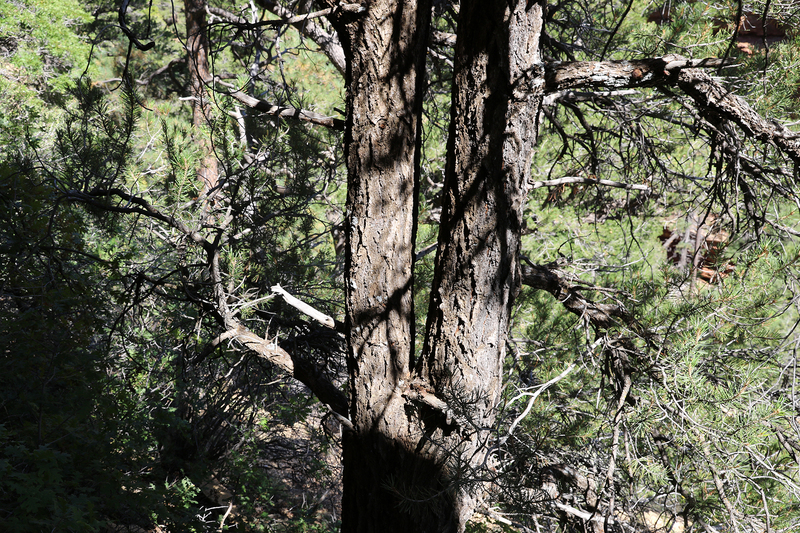 Having stretched our legs, now we were ready for some lunch. 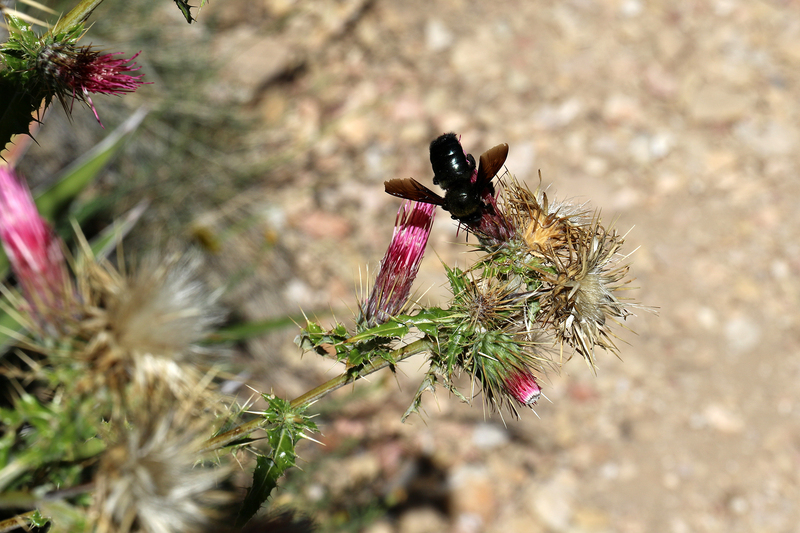 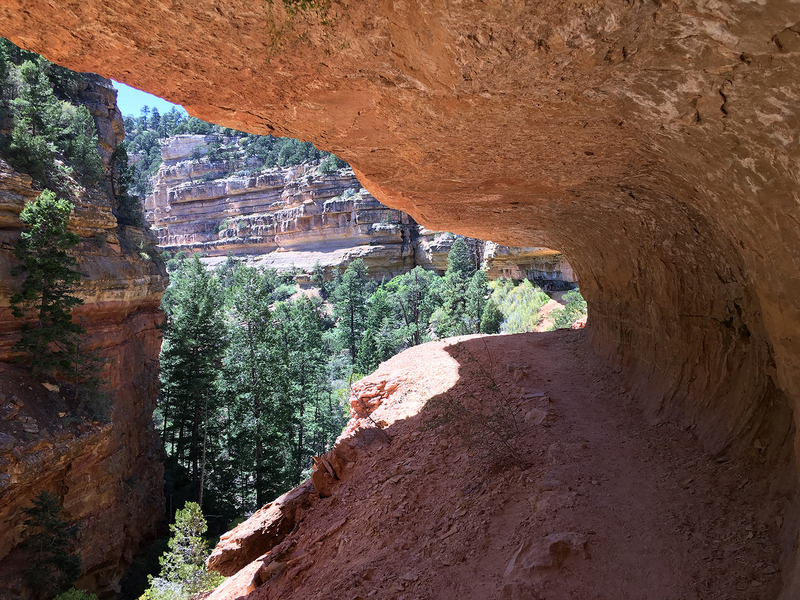 This entry was posted in Journey and tagged Arizona, Day Hike, Grand Canyon, Grand Staircase on August 6, 2017 by Brandon Hayes.